Are all those forks necessary? I just did a dining etiquette seminar for some students at a university, and many of them had the same question. Is all of that silverware necessary? Perhaps if I share a bit of history with you, the answer to the question will be evident. Early man (humans) ate with their hands. When they figured out that if liquids were contained in some way, providing more sustenance, they began to use “bowl-shaped” objects like shells and horns to drink from. That, of course, led to the creation of drinking vessels: beakers, mugs, cups, steins, glasses, etc. In the same manner spoons, forks and knives were created. The spear was used not only for capturing food, early mankind ate from the spears as well. Early mankind then discovered that a spear shaped with two points (prongs) could hold food better than a one-prong spear, thus the invention of the fork. In other words, the old English proverb “necessity is the mother of invention” holds true. As humankind grew its knowledge and need, they created more and more dining implements to meet the demands of their ever-changing diet. Each food, or type of food, required a specialized dining implement to make the dining experience easier, and in some cases, more elegant. Of course, everyone did not have “access” to the new creations. Since the beginning of time, the rich, powerful and affluent have been able to gain access when the “common man” could not. So the rich, powerful and affluent set themselves apart because they not only had access, but they knew how to use the dining implements “properly.” This implied that if you did not have the dining implements or did not know how to use them, you were poor, ignorant and boorish. This essentially was an act of classism. So the short answer is perhaps all of that silverware is not necessary all of the time, but the proper implement makes the dining experience easier and more elegant. I’m talking about moving from eating, which is necessary to sustain life, to a fine dining experience. I think you may have noticed that we have progressed (or maybe regressed) to eating with our hands again — so looks like we’re back to learning how to use dining implements all over again. Look for more dining etiquette tips in upcoming columns. Until then, remember manners are memorable; Always, put your best foot forward. Ms. J helps people to put their best foot forward by giving them tips, strategies and techniques for success with her Social Education and Life Etiquette™ (SELE™) classes, workshops and seminars. 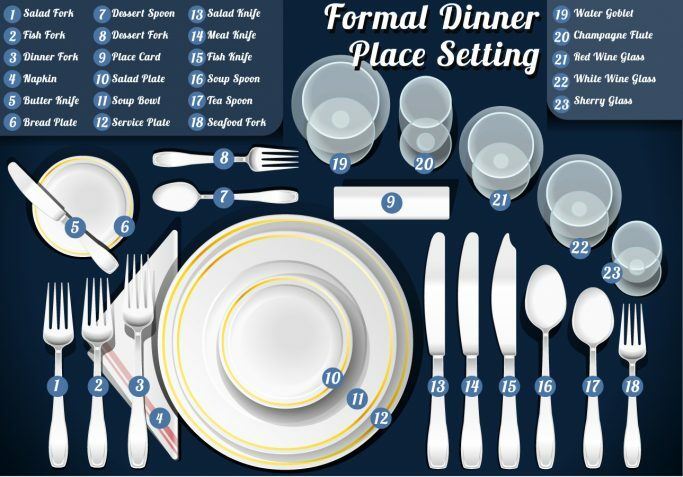 If you need help figuring out how to identify and navigate the place-setting so that you can claim your seat at the table, contact her at ms.j@mannersarememorable.com.